One of the hardest tasks that a diy video or audio producer will encounter is recording high quality audio in less than optimal recording environments. Often when we create videos for clients we are required to record audio voiceovers or other types of overdub. The uninitiated might think that you require expensive recording equipment to capture a high quality sound. In this article I’m going to show you how you can create a great audio recording environment using a cheap memory foam mattress like those you can find at bestmemoryfoammattress.info that will help you get pro sounding audio overdubs. In the recent movie Begin Again starring Kiera Knightly and Mark Ruffalo the main characters are required to record a studio album on a budget. Because they don’t have much money they decide to do it outdoors. The casual viewer might think that was because they could not afford to rent a space to record in, but anyone with a background in audio recording would have known the real reason. The real reason is that when you are inside in room, any room, the properties of the room influence the quality of the sound in that room. Think of it like when light shines through a stained glass window the light takes on the color due to the properties of the glass. Well, in recording audio, the room is like the glass. Every room that you record in acts like a fliter on the sound emphasising some fequencies and deempahsising other frequencuies. It happens because of the way the sound is reflected around the room. The sound takes on a color and for recording audio this is a bad thing. Professional studios are designedt to minimise this effect. The sound still echos around the room but the room is contructed so that the sound is not overly colored. Like a seethrough normal glass window. Buy your spare bedroom or your office has probably not been contructed like this. So anything you record in that environment will be colored by the type of room. So I promised some help on this. Well here is what we have done here at Antos for recording video voiceovers. We simply purchased a cheap memory foam mattress and used it stood on it’s end behind the recording source. So for example if we are recording a voiceover we have the narrator stand. Obviously the microphone faces the narrator but behind the narrator is a large memory foam mattress. This mattress absorbs the sound so that the only thing that the microphone which is directional is picking up is the sound of the voice and not the reflections of the room. This results in a dry sounding recording without any reverb so we digitally add in a little reverb effect to recreate the room. It’s a but like recording a green screen video. The memory foam mattress acts like the green screen, isolating only the source that we want to record and allowing us to place that source in any audio environment we choose using reverb impulse response technology. To save even more money you could use a simple memory foam mattress topper, which is a thin version like these ones here, but you will need to build a structure to help it stand up. I should add that unless you plan to also sleep on the mattress then you don’t need to pay any more than about $150 and this makes it a very affordable solution to getting high quality audio recordings done on a budget. 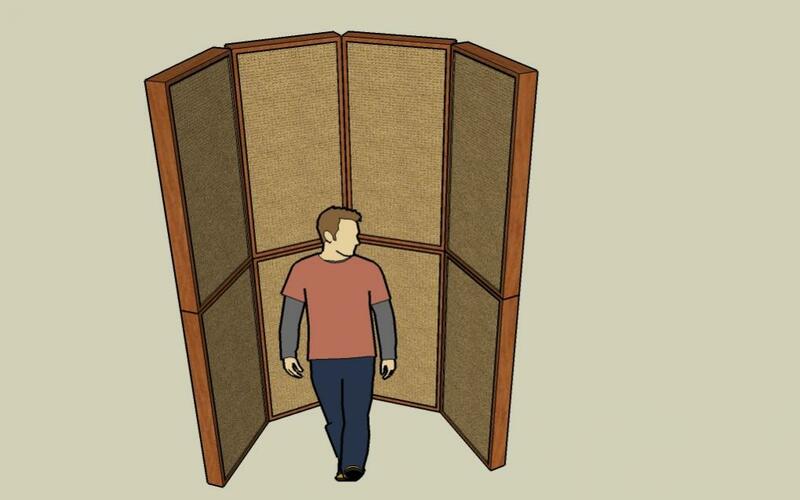 Another cheap sound gobo alternatives is the insulation material that you put inside walls but it’s very messy and itchy and I think memory foam is a much better alternative.